Rep. Keith Ellison said he is leaving Congress to take his battle against the Trump administration policies to the state level to push back against such issues as corporate monopolies and to advocate for issues like "commonsense gun safety laws" and criminal justice reform. “You know, the Trump administration’s behavior ... really illustrates how critically important state attorneys general are," Ellison, the first Muslim elected to the U.S. Congress, told ABC News on Thursday adding that the "legal resistance" has primarily come from states attorneys general. Robert McCaw, the Council on American Islamic Relations' National Government Affairs Director, told ABC on Thursday that although the Muslim community is "losing a great ally" in Congress, "we believe that his district is very well capable of electing another representative who will carry out his mission and legacy." 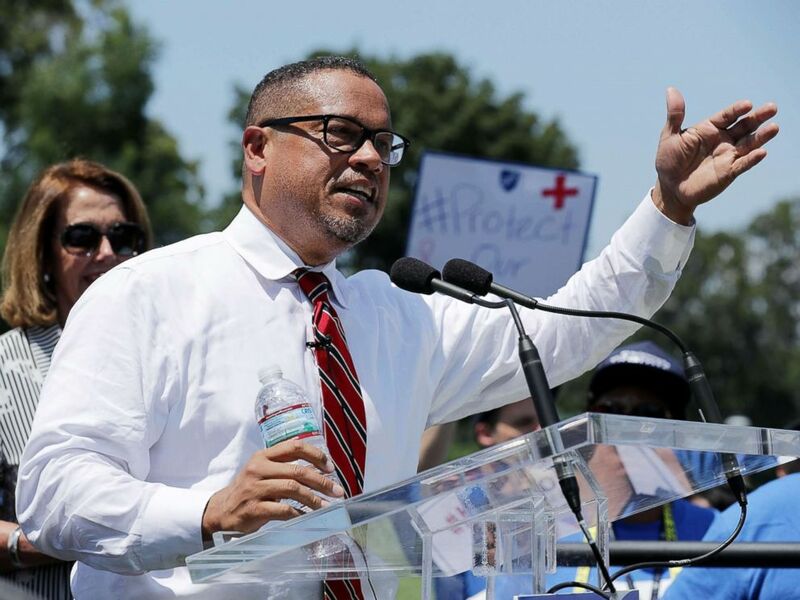 "Keith Ellison has always been a champion for justice," McCaw said adding that the organization feels Ellison will fight what they see as the administration's anti-immigrant and discriminatory agenda. The White House did not return ABC News' request for comment. State attorneys general have repeatedly challenged the implementation of the Trump administration's ban on travelers from majority Muslim countries and have taken the Trump White House to court on a number of issues, ranging from the Environmental Protection Agency's pollution requirements, to the administration's proposal to add a citizenship question on the U.S. Census. Rep. Keith Ellison addresses a rally against Trump Administration education funding cuts outside the U.S. Capitol July 19, 2017 in Washington. He said that although running for attorney general was something he "always" wanted to do, he did not expect to have to make the decision so abruptly. “Honestly, (leaving Congress) was one of the hardest decisions I’ve ever made in my life because I’ve always kind of wanted to run for attorney general ... but I didn’t want to do it in a sudden, abrupt way in a course of 24 or 48 hours." “I’m not leaving because of gridlock," he added. "I’m leaving because I’m kind of a people’s lawyer at heart and I want to fight for peoples rights … Other people, they may feel that the gridlock is too much for them."